An activist says Libyan rebels’ military commander in Zawiya, the closest opposition-held city to the capital, was killed along with three other people in fighting. Alaa al-Zawi, an opposition activist in Zawiya, says Col. Hussein Darbouk was hit by anti-aircraft gunfire during clashes with forces loyal to Moammar Gadhafi that attacked Friday morning. 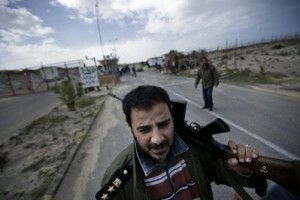 Darbouk and other troops in Zawiya defected to the opposition early on in the uprising, which began in Libya on Feb. 15. He has since been leading rebel forces in the town, which has withstood multiple assaults by pro-Gadhafi forces. Al-Zawi says three other rebel fighters were killed and dozens of people wounded in the fighting, but he says the city remains under opposition control.